our neighbor’s end of the pond. We share a natural pond with our next-door neighbors and have added a border of native plants at its edge to replace the turfgrass that used to dip right into the pond. I’ve planted ferns, black-eyed Susans, scarlet hibiscus and more. Plus other natives have also moved in. It’s not too large, about a tenth of an acre. It’s out front between our house and the front meadow. To see the layout of this part of property see my post on the meadow, “From lawn to woods: a retrospective.” We think it may be fed by a spring because the 2 big lakes in our neighborhood are spring-fed, but it’s not a strong spring. The water level fluctuates greatly in reaction to rainfall. If it gets too high, it overflows into a pipe and down a shallow, wooded ravine to the lake out back. We have loved watching the birds that swoop in to fish. The pond supports a good population of blue gill, bass, and other native fish. Shortly after we moved in 10 years ago, the neighbor had allowed someone to deposit 8 koi and 2 albino catfish that had outgrown his koi pond. 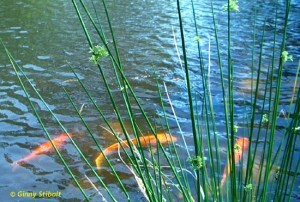 The catfish died a few years back, but we still have 4 or 5 of the koi. The fancier ones with black and white scales are gone, but I don’t know if they were caught by a bird or what. The ones that are left are mostly orange. We also have a good population of bull frogs, peepers, barking frogs, and others. We love the evening choruses that can be set off by any loud noise. On July 4th each year, they are active as many of our neighbors set off fireworks. frequently–only twice in 12 years. Florida receives about 50″ per year, but it’s not evenly distributed. We have a 5-month wet season from June though October (aka hurricane season) when we receive, on average, twice as much rain as in the 7-month dry season, but of course nothing is certain when it comes to weather—back a couple of years, we received zero rainfall in October, which is one of our wet months. The pond responds directly to the rainfall—there is not much of a watershed, just our front yard and our neighbor’s. No storm drains or runoff from roads feed into the pond, but the ambient local water table is probably a factor. Our dry season in 2007 was severe enough that our pond was as low as we’ve ever seen it. 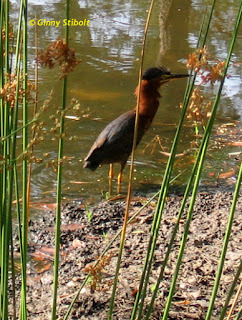 fun to watch: they often use tools to fish. When the pond is low, and if the timing is right, we’ll do some muckraking. 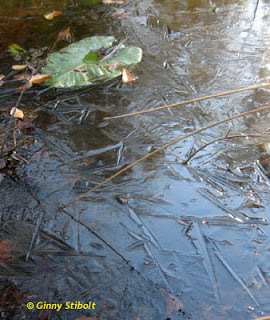 The muck in the middle is knee deep in places, removing as much of it as practical will prolong the life of the pond. Usually, we use iron rakes to pull out the un-composted leaves and other detritus into piles, and then shovel it into a cart or wheelbarrow. I like to use the old metal wheelbarrow, because there are holes in the bottom, so by the time it’s filled with muck, a good amount of moisture will have leaked out. I use the muck in moderation in the compost pile or to build up mounds in empty wooded areas so wasps and other critters have better access to it. 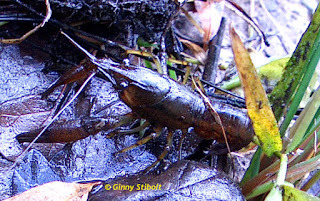 When walking in the pond, I wear my dive booties for foot protection because they can’t get sucked off by sticky mud, they provide protection from sharp objects (and maybe snapping turtles), and they have a textured sole for reasonable (but not foolproof) traction in the slick mud. 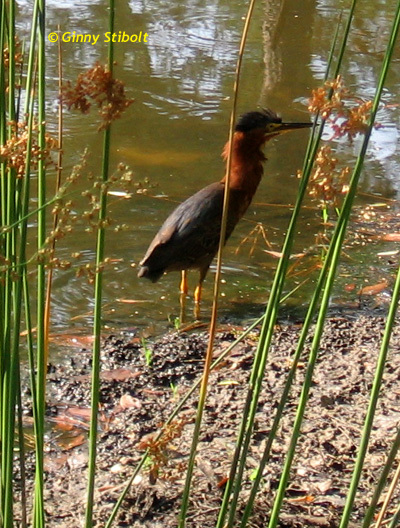 Also when the pond is low, it a good chance to weed or trim back excess vegetation around the shoreline. In the 2007 photo above, the invasive torpedo grass (Panicum repens) was growing into the pond, so I pulled it all out and with only a few additional cleanups, it is gone from the pond. This invasive was introduced to this country in the late 1800s in a mixture of forage crops. In our case it was probably brought in with the original sod that the former owner had used. It’s still plentiful in the lawn areas, but I try to control it elsewhere. along the shoreline hidden among the leaves. the basking log we installed at the shoreline.. If you are not blessed with a natural pond, it’s worthwhile to add one for the amazingly rich habitat it creates. Don’t skimp on the size. Build the largest one that you can afford and that will fit in your landscape—you can add plants and other stuff later. Remember this will become a working ecosystem so be prepared for surprises—pleasant and unpleasant. We love all of our turtles. We have mostly Florida cooters and mud turtles, but occasionally we’ll see a wicked-looking snapping turtle. 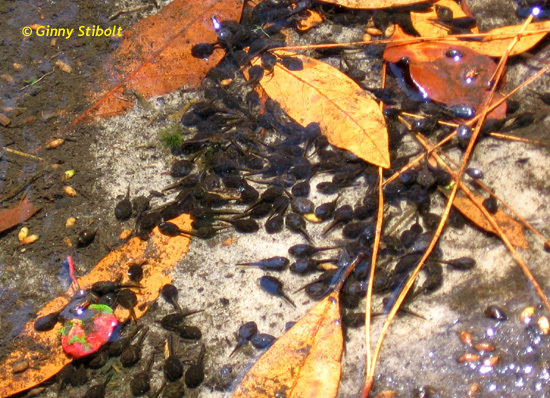 Tadpoles gather in shallow water to avoid the bigger fish, but then they are easier prey for that cute green heron in the photo above. Soft rush (Juncus effusus) has planted itself at the edges of the pond. You can see 3 of the koi, and if you look closely, there are also 3 circular areas of light bottom where the bass have made nesting areas. 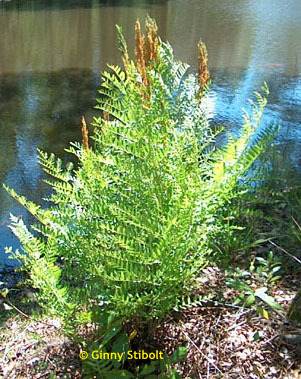 Royal Fern (Osmunda regalis) occurs naturally at the edges of the pond. The cinnamon ferns tend to occur in more upland locations. This white-lined sphinx moth (Hyles lineata) larva is a hornworm that feeds on plants in the evening primrose family. 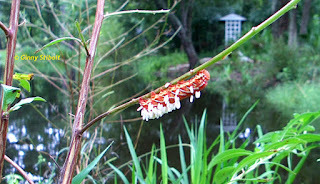 The coloration of the worm is variable and this brightly colored individual has been infested with parasitoid cotesia wasp larvae (Cotesia congregata). The wasp larvae will feed on the worm. It’s a larvae eat larva world at the edge of the pond! In the background of this photo, you can see our pond swing. We hosted a 30″ gator in our pond for a couple of weeks in May 2015, but by the time the gator hunters came, he had moved on. We were happy that he avoided getting caught this time. 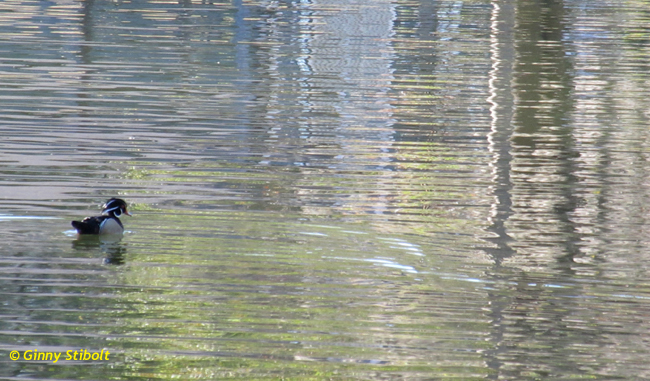 A lone wood disturbs the reflections in the pond in 2010. Our pond was attacked a couple of years ago and we had to take action, because *things* were not going to get better in the pond without intervention. 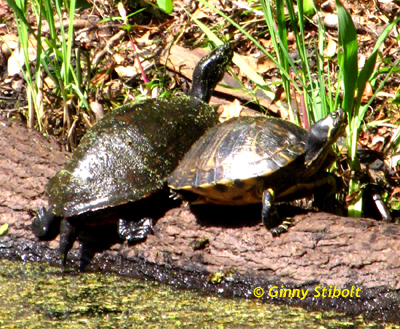 See part 2 of my pond adventures.